Philosophy Field Course: Friends of Clayoquot (part 2) - what is the future of environmentalism? Back in the protest days of the 1990s, The Friends were aligned with First Nations and other environmental groups in opposition to logging. It is now standard for these industries to partner with First Nations. Often this involves consultation with First Nations representatives before a development application is submitted to government. These partnerships increase a project's likelihood of approval. Importantly, they also provide First Nations with an opportunity to direct these projects. The terms of the partnership agreements are not available on public record. So it is impossible to assess their equity. But the very fact that First Nations now contribute to shaping their traditional territories is undeniably progressive. Of course, this places environmentalists in a difficult position. They have lost an important ally in their campaign against industry. It is also difficult to find the right moral platform from which to criticize activities that have First Nations approval. If one agrees that the Nuu-Chah-Nulth have the moral and legal title to these lands, on what basis can one criticize their management practices? Matters are very different when we are talking about crown land. In that case, Canadian citizens are entitled to a say in land management. Not so for First Nations territory. One must also keep in mind the historical oppression of these groups, and just how important it is for them to finally gain control over their own destiny. An environmentalist might well be suspicious of partnerships between First Nations and industry. How equitable are these agreements? Whom exactly do they benefit? These are questions that I will touch on in more detail in my discussion of Mainstream Salmon and Iisaak. Naturally First Nations communities do not speak with a single voice. Some individuals are less than entirely supportive of these industrial partnerships. However, First Nations communities need to work as one. This culture is also quite hierarchical, with hereditary Chiefs being key decision makers. I asked someone whether he considered opposing the decisions of his band. The answer was that, “not if I want to keep my friends”. (See my earlier post on the two dimensions of personal relationships). I am somewhat critical of The Friends for failing to acknowledge these advances. No mention is made of the reduction in feed, the reduction in antibiotics, the reduction in harm to predators, the aeration of pens, the decrease in stocking densities, nor the rotation times among pens. Failing to acknowledge these advances and presenting the fish farms of today as no different from 20 years ago is inaccurate and arguably negligent. I put it to Dan that his group might even take credit for these improvements. Creative Salmon acknowledges environmental concerns as one of the motivations behind their advances. But this suggestion apperaed not to sit well with Dan. This strikes at the heart of how environmentalists have traditionally regarded themselves, as champions of the people fighting against evil corporations. Nowadays, this attitude appears too black and white. The danger, as I see it, is that environmental groups are risking their credibility. Industries like Creative Salmon and Iisaak are not as media savy as The Friends. The message of their imrpovements is taking longer to get out. But eventually this will change. Environmental concerns are now consumer concerns. It is in these industries' economic interest to broadcast their achievements. If it becomes common knowledge that fish farms and logging companies are cleaning up their acts (as I think is happening), and that these efforts are being ignored or misrepresented by environmentalists, those advocates will appear uninformed and ideologically driven. 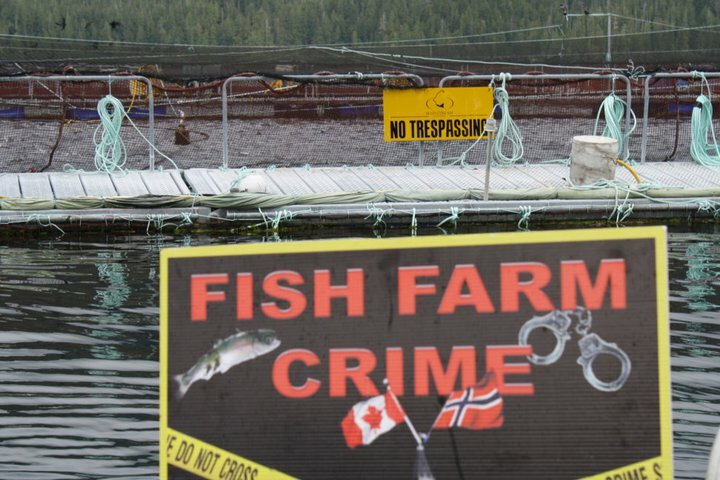 Another way in which The Friends and other advocacy groups have responded to these changes, at least in the fish farming case, is to identify new putative harms to the environment. Most recently the issue has been a decrease in wild salmon stocks. Fish farms are held responsible for this decline because they are seen as incubators for disease. This is a very complex issue and I do not pretend to understand its nuances. However, from a philosophical perspective, three important questions arise. Firstly, what is the magnitude of these environmental harms? 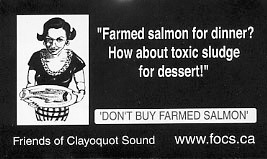 Some argue that the presence of fish farming in Clayoquot will cause the local extinction of wild salmon. Is this scenario plausible? Or is it more plausible that they will result in at modest reduction, or none at all? This is a difficult scientific question. One should not assume that environmentalists are in possession of the answer. Lately, some environmentalists have taken rhetorical steps to exacerbate the magnitude of these harms. They claim that wild salmon are a part of “our” heritage as British Columbians. Suddenly fish farming is a threat to "our" social identity. As a born British Collumbian of non-native descent, this strikes me as a bit desperate. 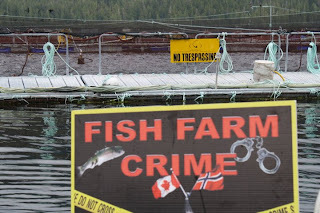 Second, would the purported harms occur regardless of fish farms? For example, some argue that habitat destruction, not disease, is the driving cause of salmon decline. Perhaps even more significant is a point that our group raised in opposition to Dan Lewis. Any decrease in fish farming will most likely increase the pressure on wild stocks. There is no wild population in the world that can sustain human consumption at current population levels. If the collapse of the East Coast cod fishery has taught us anything, it is that wild fish stocks are difficult to manage. 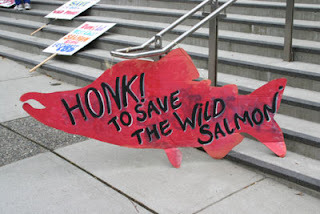 So how exactly does the elimination of fish farming benefit wild salmon? It seems just as plausible that a reduction in farming will negatively impact wild salmon populations in the long run? The third question concerns the benefits of fish farming. How do they stack up against the purported costs? I spoke in my previous post about the social and economic benefits of these industries for local communities. There are further potential benefits when it comes to feeding a global population. Perhaps a reduction in wild salmon stocks (if in fact this is a consequence - I am not so sure) is an acceptable price to pay for these outcomes. A final thought on this issue. In raising these criticisms of The Friends I am very aware of what I do not know. They might turn out to be right about the link between fish farms and wild salmon decline. What concerns me is their willingness to advocate a position as if the factors ARE well known. I see this as irresponsible given that the harms of removing fish farms are arguably more tangible than the purported consequences of allowing them to persist. It also concerns me that environmentalists ignore larger, more global ecological issues. If fish farms are removed from this region, where else will they go? Perhaps to a country with even lower environmental standards, and what then will the impacts be? Ultimately, I think that environmentalists are still fighting the same battle that they were 20 years ago. But the situation has changed. Consumers are more informed. Industry has become more responsible. Communities like the Nuu-Chah-Nulth are realizing social and economic benefits that must be balanced against environmental costs. If these issues ever appeared black and white, they certainly do not seem that way anymore. How will environmental organizations adapt to this new political landscape?